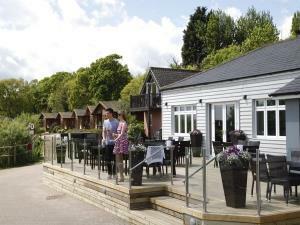 The Waveney Inn at Waveney River Centre01502 677599work BarThe Waveney Inn is our waterside destination pub - completely refurbished for 2014 and offering a menu of delicious, locally-sourced food, freshly prepared and cooked on the premises. Menu favourites include our home made burgers, delicious fish & chips or succulent calamari. You could try one of our popular sharing boards, or a prime cut of steak from our award winning butcher, Pepperells. The Waveney Inn is our waterside destination pub - completely refurbished for 2014 and offering a menu of delicious, locally-sourced food, freshly prepared and cooked on the premises. To complete the experience, try our new luxury hotel rooms with comfortable super king size beds, 40" HD smart TVs and fabulous shower rooms.